Under the Rome Statute, the ICC has jurisdiction over the following crimes: genocide, crimes against humanity and war crimes (Arts. 5-8). The Statute provides detailed definitions of those crimes, which are very important developments in the relatively new area of international criminal law. Once in operation, the Court developed its Rules of Procedure and Evidence and The Elements of Crimes that provide additional due process protections for those accused of crimes by the Court. These also are important contributions to this area of the law and to the ongoing global struggle against impunity for human rights violators. The above exception to ICC jurisdiction is known, in ICC parlance, as the principle of “complementarity.” In other words, the ICC is a court of last resort. To further this limited role, the ICC has been engaged in helping certain states to improve their own judicial ability to handle ICC-type cases. This is often referred to as “positive complementarity” within ICC circles. The Pre-Trial Division, which has responsibility for various matters before trial. Six judges with predominantly criminal trial experience are assigned to this division, and they conduct the business in chambers of one or three judges. The Trial Division, which has responsibility for conducting the trials. Eight judges with predominantly criminal trial experience are assigned to this division, and they conduct the business in chambers of three judges. The Appeals Division, which has responsibility for handling any appeals from the other divisions. Five judges are assigned to this division, and all five judges conduct the appeals in the Appeals Chamber. The Court’s Prosecutor is elected by the Assembly of State Parties for a single nine-year term. (Art. 42(4).) The Prosecutor has authority to conduct investigations into situations that are referred to the Court by the U.N. Security Council or a State Party under Articles 13(b) and 14 of the Rome Statute or upon his or her own initiative (proprio motu) under Article 15(1). Under the Rome Statute the Prosecutor is invested with specific duties regarding investigations and prosecutions and is subject to various checks and balances from the Pre-Trial Chamber and others (States Parties and the U.N. Security Council when making referrals). All of these provisions are some of the protections provided to those who are accused by the ICC and should provide comfort to those like some in the U.S. who believe that there are no checks on a hypothetically biased Prosecutor. Future posts will discuss the Court’s current situations and cases, the 2010 Review Conference and definition of the crime of aggression and the U.S.’ relations with the Court. ICC, The States Parties to the Rome Statute, http://www.icc-cpi.int/Menus/ASP/states+parties. This is the Court’s own website, which has extensive information about the ICC. Another useful website is the official one about the Rome Conference of 1998 that developed the treaty that governs the Court (the Rome Statute): http://untreaty.un.org/cod/icc/index.html. The list of States Parties has been updated to June 22, 2011. Seychelles will become the 31st African state to join the ICC on November 1, 2010. The principal African states that are notICC members are Algeria, Angola, Eritrea, Ethiopia, Libya, Rwanda, Somalia, Sudan and Zimbabwe. (Compare id. with U.N., List of Member States of United Nations,http://www.un.org/en/members/index.shtml. The principal Asian states that are not ICC members are China, Democratic Republic of Korea, India, Indonesia, Iran, Malaysia, Myanmar, Pakistan, Philippines, Thailand and Viet Nam. Id. The principal European states that are not ICC members are Belarus, the Russian Federation and Ukraine. Id. The principal Latin American and Caribbean states that are not ICC members are Cuba, El Salvador, Guatemala and Nicaragua. Id. The only Middle Eastern states that are ICC members are Cyprus and Jordan. Id. Canada is the only North American state that is an ICC member. The U.S.A. is the only North American state that is not an ICC member. Id. There are 192 members of the U.N., and a non-member of the U.N. (Cook Islands) is an ICC State Party. Thus, the total number of states in the table is 193. Id. The Rome Statute also grants the ICC jurisdiction over the crime of aggression, but since that crime was not defined in the Statute, the Court could not exercise that jurisdiction. (Art. 5(2).) At the Court’s 2010 Review Conference, such a definition was added. This will be the subject of a future post. 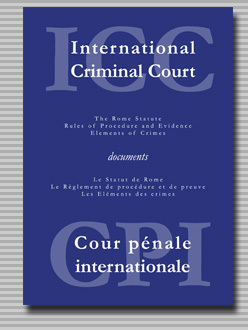 ICC, Basic Legal Texts, http://www.icc-cpi.int/Menus/ICC/Legal+Texts+and+Tools. E.g., ICC, Resolution on Complementarity (RC/Res. 1 June 8, 2010), http://www.icc-cpi.int/iccdocs/asp_docs/Resolutions/RC-Res.1-ENG.pdf; AMICC, Report on the Review Conference of the International Criminal Court (June 25, 2010), http://www2.icc-cpi.int/Menus/ICC/Home; http://www.amicc.org. The recent Review Conference adopted a declaration that reemphasized the obligation of States Parties to arrest those subject to ICC arrest warrants. (ICC, Declaration on cooperation (RC/Decl.2 June 8, 2010), http://www.icc-cpi.int/iccdocs/asp_docs/Resolutions/RC-Decl.2-ENG.pdf. Since the end of World War II, we the peoples of the world, acting through our nation-state governments, have codified or created numerous international human rights norms. This started with 1945’s Charter of the United Nations and 1948’s Universal Declaration of Human Rights and the Convention on the Prevention and Punishment of the Crime of Genocide. Other multilateral human rights treaties have followed, including the International Convention on Civil and Political Rights, the International Convention on Economic, Social and Cultural Rights and the Convention Against Torture and Other Cruel, Inhuman or Degrading Treatment or Punishment. Given the world’s nation-state sovereignty basis, we the peoples of the world have grappled with the very real problem of how to enforce such norms in order to punish violators, to deter future violations, to provide redress to victims and survivors, and to investigate and promulgate the “truth” about past violations. The response has been the creation of various mechanisms, none of which is perfect: state reporting to U.N. Charter and treaty bodies for review, comment and recommendations; complaints by states and individuals to such bodies for recommended solutions; international investigations of specific countries or problems; civil litigation for money damages against violators in domestic courts and international courts like the Inter-American Court of Human Rights; and truth commissions. Another response has been seeking to subject violators to criminal sanctions (imprisonment) in national courts under the international law principle of universal jurisdiction whereby a nation’s courts have legitimate criminal jurisdiction over genocide, crimes against humanity and war crimes no matter where in the world such crimes were committed. Criminal sanctions have also been imposed by international criminal tribunals like the Nuremberg and Tokyo War Crimes Tribunals at the end of World War II and more recently by so called ad hoc tribunals created by the U.N. Security Council (the International Criminal Tribunal for the Former Yugoslavia (ICTY) and the International Criminal Tribunal for Rwanda (ICTR)). Even more recently the International Criminal Court (ICC) has been created. Collectively these mechanisms often are referred to as international criminal justice. In future posts we will examine a Spanish court’s use of the universal jurisdiction principle to commence criminal investigations. In other posts we will analyze the International Criminal Court and its relations with the United States. David Weissbrodt, Fionnuala Ní Aoláin, Joan Fitzpatrick, and Frank Newman, International Human Rights: Law, Policy and Process, ch. 1 (4th ed. 2009) [“Weissbrodt”]. Id. , chs. 4-6, 9, 11, 12, 14, 15, 16. Id. at 11, 483-586. The text of the Rome Statute, which will be referenced throughout this article, is available at: http://www.icc-cpi.int/NR/rdonlyres/EA9AEFF7-5752-4F84-BE94-0A655EB30E16/0/Rome_Statute_English.pdf. It is hard to believe that the 10th anniversary of my retirement from the practice of law is nearly here. I have no regrets. I made the correct decision. Here is my own grading of how I have met my retirement goals that I set 10 years ago. Being a good Grandfather. I now have four grandchildren, two in Minnesota and two in Ecuador. My wife and I obviously spend more time with the Minnesota kids, and our Ecuadorian grandson spent last Fall in Minnesota going to school with his cousins. We also frequently have traveled to Ecuador to see our family there although we have decided not to spend significant amounts of time there. I recently took my 10-year old Minnesota grandson to visit two federal judges and some friends at my former law firm and to observe parts of a trial and a court hearing. I leave it to the grandkids to judge me on this goal, but I think I have done a pretty good job. I know I enjoy being a grandfather. Being a good Father and Husband. I also have been making an effort to be a good father and husband. I am still working at it. Learning Spanish. I have not taken the time to improve my very limited Spanish ability. I still wish that I were fluent in that language, but do not see myself taking the time to do this. Sorry. Law Teaching. I had a goal of teaching law in Ecuador. I was interviewed by a university in Quito about teaching law in the English language, but I was not offered a position. My son who lives there went to the interview with me in case I needed an interpreter, and afterwards he said he thought that my positive comments about liberation theology may not have been appreciated by the university officials. In retrospect, I am not unhappy with this result. I would have had to work very hard to organize and teach one or more courses in this foreign country. Moreover, this development opened the door for my having the opportunity to co-teach one course (international human rights law) at the University of Minnesota Law School for nine years (2002-10). This built on my experience as a federal court litigator and as a pro bono asylum lawyer. It also allowed me to work with, and become friends of, other professors at the Law School and many U.S. and foreign students. One of the foreign students was a Hubert Humphrey Fellow from Brazil who was a Professor of Law and Criminology at the Catholic university in Rio de Janeiro, and at her subsequent invitation, I presented a paper on the Truth Commission for El Salvador at a conference in Rio in 2009. In addition, through my work at the University of Minnesota I developed a strong interest in, and some expertise about, the International Criminal Court, and I have made many presentations about the ICC and have served as the Provisional Organizer for the Minnesota Alliance for the ICC. I recently decided that I would retire from this teaching job even though I have thoroughly enjoyed it. I wanted to have more time for writing as discussed below. Human rights legal work. Without the support of a law firm, including its professional liability insurance, I decided I was not able to do pro bono legal work in retirement. But as mentioned above, I have been able to teach human rights and learn more about the subject myself. I also have developed an interest in the ICC and found a way to make use of that interest. News “distributor.” Although not one of my goals from 2001, I have developed a practice in retirement of regularly reading many news sources online (New York Times, Washington Post, Huffington Post (Politics page), Wall Street Journal, Guardian (from the U.K.) and Granma (English translation of Cuba’s major national newspaper) and occasionally others (New York Review of Books, Atlantic and Harpers). After doing this for a while, I started sending by email interesting articles on human rights, the ICC, immigration, Cuba and Africa to friends who were interested in these subjects. Arbitrator. Another retirement activity I had not anticipated in 2001 was being an arbitrator. But I have done so for disputes between investors and financial firms through the Financial Institutions Regulatory Authority (FINRA; f/k/a National Association of Securities Dealers), usually as chair of a panel of three arbitrators, and I have enjoyed this challenge. I try to act like the arbitrators and judges I respected in my practice: fair, impartial, respectful of the law, organized, decisive and clear (unlike some of the judges on the TV show “The Good Wife”). Recently, however, I decided that I no longer wanted to spend my time working on other people’s problems and will not take any more cases. Sounds like my 2001 decision to retire from practicing law. Obituary writer. Yet another surprising development over the last half-year has been being an obituary writer. As a member of my Grinnell College class’ 50th reunion committee, I have been responsible for writing or commissioning obituaries for our 53 deceased classmates. This used my factual research and writing skills from lawyering. I also came to see this activity in some cases as one of pastoral care for the families of the departed. International travel. In addition to many trips to Ecuador and my trip to Brazil, my wife and I have been on many other fascinating international trips in the last 10 years. They include an Elder Hostel trip about Mozart to the Czech Republic and Austria, Turkey, Spain, England and Scotland, South Africa, Namibia, Botswana, Canada, Mexico, El Salvador and Peru plus my church mission trips to Cuba and Cameroon. These were great, educational experiences. I was really glad that I was in good health to be able to take these trips. I also have been able to chair a committee that supervises the global partnerships of Westminster Presbyterian Church. Historical research and writing. I wanted to conclude my research about Joseph Welch and Edward Burling and write articles about them. I have done so, as was mentioned in a prior post. I will share some of the key points of that research in future posts. On the other hand, I have not yet been able to do additional research on two of my ancestors, but it is still a goal. Personal journal and memoirs. I have not been able to make much progress on the goal of writing a personal journal and memoirs. I was hung up on the issue of how do I organize or structure such a writing project. Recently, however, I started this blog and have found it a great way to do the writing that I wanted to do. I do not have to worry about how I might organize all of these thoughts. It is really exciting to be able to write this blog. Physical exercise. I have been more diligent in my personal exercise program although I should be doing more. Financial planning and management. With the assistance of an able investment professional, I have developed appropriate methods for financial planning and management for retirement. Like nearly everyone else, we suffered financially in the recent deep recession, but we have made progress since then. I know that I am fortunate when I read articles about the many people who have not saved enough for retirement or who lost their pensions or retirement savings in the recent deep recession or through collapse of their former employers or financial fraud or who struggle to survive with investments in bank CD’s or federal securities that now pay virtually nothing in interest. In short, I am happy with my efforts to meet my retirement goals over the last 10 years. Now I need to continue my pursuit of these now modified goals during the next phase of my life. Post: Retiring from Lawyering (4/22/11). This trip to the federal courthouse and my former law firm was inspired, in part, by recent comments of Mary Robinson, the former U.N. High Commissioner for Human Rights. Post: Tip for Grandparents (4/11/11). The Minnesota Alliance is part of the American NGO Coalition for the International Criminal Court or AMICC, http://www.amicc.org. Post: Adventures of a History Detective (4/5/11). Ten years ago I was contemplating early retirement from the practice of law. I systematically tried to analyze the pros and cons of such a decision and summarized these thoughts in an essay that a friend used in a seminar for other lawyers. I discussed the issues with friends at college and law school reunions. I was inclined to continue my legal career because it was the more financially secure option, because I enjoyed (for the most part) the challenges presented to a lawyer that were discussed in a prior post and because it was difficult to give up the status and sense of identity of being a lawyer. On the other hand, the previously discussed negative aspects of practicing law said, “retire.” So too did the increasing stresses of the lawyer’s life. This thinking and these discussions lead to my decision to retire 10 years ago. Most important for me were two points. First was the realization that the longer you worked, the shorter would be your life after full-time working along with the greater risk that you would not be in as good as health later. Second was the question: what do you want to do with the rest of your life? Continue focusing as a lawyer on trying to help others with their problems? Or focus on your own life? Clearly I wanted to focus on my own life while I still had good health. My decision to retire was confirmed at a worship service at Fourth Presbyterian Church of Chicago on North Michigan Avenue immediately after my law school reunion. The topic of the sermon “Called” by Rev. John Buchanan was vocation. The Biblical texts were Jeremiah 1:4-10 and Mark 1:16-20. Throughout our lives, Rev. Buchanan said, we should strive to discern what God is calling us to do with our lives, and then we need to respond to that call. Be a good grandfather to a grandson in Minnesota and a grand-daughter (and another grandchild on the way) in Ecuador. Be a good father to two adult sons and a good husband. Teach law in Ecuador in the English language and spend more time in that country. Continue to do human rights legal work in some way. Conclude my research about Joseph Welch and Edward Burling and two of my ancestors and write articles about them, as was mentioned in a prior post. Write a personal journal and memoirs. Be more disciplined in physical exercise. Develop appropriate financial planning and management for retirement. In making this decision, I recognized that I was very fortunate to be in a position where I could afford to retire. I did not have to continue working in order to be able to put food on the table and have a roof over our heads. Krohnke, Who, me, retire? A Recently Retired Lawyer’s Reflections on Retirement (June 2001), http://www.acrel.org/Documents/Seminars/Whome.htm. I hope this essay is helpful for lawyers and others who are contemplating retirement. Post: Ruminations on Lawyering (4/20/11). The Bible, Jeremiah 1:4-10, http://www.biblegateway.com/passage/?search=Jeremiah%201:4-10&version=NIV. The Bible, Mark 1:16-20, http://www.biblegateway.com/passage/?search=Mark%201:%2016-20&version=NIV. Post: Adventures of an History Detective (4/5/11). Practicing law, especially litigation, had many rewards. It was challenging. Tactics and strategy had to be developed and implemented. You had to know or quickly learn many different areas of the law. You had to learn about new business practices and industries. You had to become skilled at investigating factual issues through the formal litigation discovery processes and otherwise. This includes the skill of asking questions, especially on cross-examination. You had to pull all the factual and legal pieces together into an effective and persuasive story and argument. You had to be able to present these arguments, in writing and orally, to your adversaries and the courts. You had to be able to persuade others–judges, juries, other lawyers, clients, witnesses and opponents. You had to be able to think on your feet. You had to organize and manage a team working on the case. In all of this you needed to develop and maintain the trust and confidence of your clients as you guided them through the very stressful litigation process. It was like a multi-dimensional chess game. Nor can I forget that this work was financially remunerative. Such legal practice, however, has its negative side. In order to be an effective advocate, you needed to understand and empathize with your client and have some emotional identification with the client. At the same time, you needed to have emotional separation from the client so that you could be the analytical professional counselor who could point out weaknesses in the case to your client and develop an overall assessment of the case. This balancing act is not easy and is very stressful. When a case has not settled and the time for trial approaches, you shift into a higher gear where preparation for trial becomes nearly an all-consuming endeavor. When the trial actually starts, you shift into an even higher gear. During a full day in the courtroom, you are an actor in a drama that you also are co-directing: you are asking questions, making objections and arguing issues with opposing counsel to the judge while in the back of your mind you are trying to digest what has been happening and thinking about what is coming next. When the day in court is over, you retreat to your office or hotel room to start preparing for the next day: doing additional preparation of witnesses, supplementing your own preparation and revising tactics and strategy for the rest of the trial in light of what happened at trial that day. Early the next morning before going to court, you continue this preparation, often over new ideas that kept you from sleeping during the night. Somehow you also try to sleep and eat enough food to keep going. Need I say, this is stressful. Most cases settle, and when they settle while you are in the trial preparation or actual trial mode, there is both relief and disappointment. Relief that you do not have to go through the remaining agony of a trial. Disappointment that you are not able to use all of the work that you have done to get ready for trial and to test yourself in the crucible of the trial. Moreover, increasingly over my years of practice, some opposing lawyers in cases were exceptionally difficult people. Some, I thought, developed a modus operandi of trying to get under their opponents’ skin and thereby distract them from the case at hand and to intimidate them. Some were dishonest. Moreover, you could not get away from this other person; by the necessities of the case, you had to have continuous dealings with the person. In one case, I had dreams (nightmares?) of pushing an opposing lawyer off a cliff. Judges could also be thorns in your side, especially when setting deadlines or dates for hearings or trials that interfered with your previously arranged personal plans. I came to understand that the U.S. litigation process usually drives the opposing parties further apart, rather than produce reconciliation. In addition, when a case was finally over, even when you had obtained a favorable result for your client, you understood that the client was at least privately thinking that he or she hoped they would never have to see you again because if they did that would mean they were involved in another stressful and expensive lawsuit. Who needs or wants a headache? In reaction to these negatives of the litigation process, I became interested in alternative dispute resolution. I studied ADR and became a mediator and arbitrator. I also served as an officer of the ADR Section of the Minnesota State Bar Association. I wrote articles about ADR, especially its ethical issues. Eventually, however, I concluded that it was too easy to become an ADR “true believer” focused on the processes of resolving disputes and that did not provide personal satisfaction. After 20 years of practicing law, by happenstance or the will of God, I was presented with a case for the American Lutheran Church that opened the door for me to international human rights law. That case and my further work in this area of the law will be subjects of future posts. From April 1970 through June 2001, I practiced law with the Minneapolis office of the eminent Faegre & Benson law firm, first as an associate and then as a partner and of counsel. I was in its business litigation group and handled many kinds of cases, including dealer/distributor terminations, securities fraud, antitrust, copyright, trade secrets and contract. I also assisted in drafting dispute resolution provisions for contracts prepared by others in the firm. I particularly liked being in a large law firm. Large firms tended to get the more challenging and remunerative cases. I could easily obtain assistance from other lawyers who specialized in different aspects of the law or who could discuss difficult tactical and strategic problems. Faegre also encouraged its lawyers to provide pro bono legal services. Moreover, I did not have to participate in managing all of the firm’s many business details. Practicing law itself took a large hunk of my time, and I did not want to pile on the additional time necessary for management. I, however, did participate in the work of some of the firm’s committees–Alternative Dispute Resolution and Legal Assistants. Over 31 years there are too many fellow lawyers at the firm with whom I had excellent professional relations to mention them all. Instead I will just call out a few of my seniors from my group in the firm: John French, who had been President of the Harvard Law Review, a U.S. Supreme Court clerk for Justice Frankfurter and a leader of Minnesota’s Democratic Farmer Labor Party; Larry Brown; Gordon Busdicker; Norman Carpenter; and James B. Loken, who had clerked for U.S. Supreme Court Justice Byron White and been an assistant to President Richard Nixon and is now a Judge of the U.S. Court of Appeals for the Eighth Circuit. On Thanksgiving Day of 1982 Minneapolis had the largest fire in its history. It started in the demolition site of a former downtown department store and soon engulfed most of the adjacent Northwestern National Bank Building that housed the Faegre offices. That bitterly cold night my wife and I went to watch the fire and saw flames shooting out the windows of my office on the 13th floor. (The next week we in hard hats were escorted to my floor where I found my completely destroyed office and here and there a few fragments of papers from my files. For several weeks thereafter I had nightmares of being caught in the fire.) Amazingly the firm opened for business the following Monday in new offices in the nearby IDS Center. The other attorneys and I immediately set out to recreate the files in our active cases and files by requesting copies from clients, other attorneys and the courts. Luckily by then the firm used computers to record and manage the firm’s billable hours, i.e., its inventory of unbilled time, and stored a duplicate set of the computer records in another building. Previously the firm’s records of unbilled time had been manually recorded on heavy-stock paper and maintained in three-ring binders all over the office; they probably would have been destroyed in the fire. Such unbilled time is a major asset of a law firm, and the loss of such an asset probably would have doomed the firm. Some of my cases over these 31 years cases are memorable and important and will be discussed in future posts. They include cases involving issues of constitutional law and contract, auditor’s liability, international arbitration, securities fraud, copyright, patents and trade secrets. In addition, in the mid-1980’s I became a pro bono (no fee) lawyer for foreigners seeking asylum in the U.S.; as will be seen in a subsequent post, this has had, and continues to have, an enormous impact on my professional, political and religious life.